for the greatest gift is given with death. car l’ultime cadeau est donné avec la mort. This bilingual collection is a series of poems to remind us of what gives birth both to the literary imagination and to identity. It reminds us of those people, memories, and desires we carry around within us, often without knowing it, until we sleep, dream, and remember our most precious feelings, memories, and sensations. Cardona’s poetry reminds us of those people, memories, and desires we carry around within us, often without knowing it, until we sleep, dream, and remember our most precious feelings, memories, and sensations. This is the language of transcendence, of mythological and Jungian dream analysis that allows us to perceive parts of the self that are both lost and found in symbolic language. Here is the language of magic, of fairies and spirit animals (especially birds and horses), which embody physical and spiritual grace that reveals special things to the poet—both inner and outer sides of herself returned, after loss, which link her to her ancestors, to the seemingly dead or forgotten, and to the beauty of the creative and intellectual life emerging from lost figures, and thus help her to develop inside. One wonders to what extent these travels and forced departures were real or imagined, and neither in sleeping nor in waking can we be certain whether these are imposed from the outside or inside; nor does it matter. We are certain that the poetry which reminds us who we are and where we have been is of utmost importance and brings us back to the root system of soul, psyche, and personality. This spiritual home “[begins] with a dream”; “[t]he dream opens forgotten realms of creation” (“Pathway to Gifts”): the birth of the child that imagines her conception in the “shiver down [her] mother’s / spine” that is congealed in “the melancholy in [her] father’s eyes, / reflecting Lake Geneva” (“From the Heart with Grace”). These signs and forms of unspoken communication were once “indecipherable” to her younger self, but in reflection the poet remembers that these were always part of “a language older than time,” a language completely human, maybe more so than words. And yet words are so important to this writer. They are not just vehicles of communication but “whimsical metaphoric frontiers” opening up gates to the unknown, beyond the cellular toward the spectral. If they are used at all, they are to be treated as precious gems, each to be chosen, cut, shaped, and set into her design with care, like her poems. For neither Cardona nor her imaginary or mythological worlds are merely shape-shifters; they are “griffons,” “mermaids,” and “chameleons.” She is not merely a tree who remembers her roots, in Spain, Switzerland, or in the creative mind that eschews a “quintessential” and existential “distress,” but she is one rooted in a “jeu d’esprit, glückliche Reise.” She is not a passive recipient of the earth’s gifts and cornucopia, but one who “propels the fervent fragrance / of heliotrope, hyacinth and honeysuckle.” She is a generator of all that is good, which we desire on earth and in the mind. This is the honey that brings forth sweets for the soul: the consolation of art. This ability to become the jewel-maker of words, the metaphorical honeybee, the generator of dreams and of all life’s eternal joys, is divine. It is the eternal gift of life, for if you find yourself on the road, through forced or chosen departures, it is essential for us all (particularly the artists among us) to imagine that the “[w]ind . . . offers / . . . three cups overflowing / with eternity”—the symbol of fulfillment in Tarot. In Cardona’s universe, as long as the mind and spirit are alive and “on the wing,” the cups are always half-full, and we may hope to be as resilient as she—like the “thistle” that is her surname, “Cardona”; that which dreams and endures the tides, seasonal change, and fickle conditions of life. To allow the changes, deaths, removals, and currents that take us along their path, if not to our intended one, is to remind ourselves that we are all mere travelers, not just on earth but in the “corridors of mind,” and that even if we must leave people and possessions, homes and countries, behind, in reaching our soul’s destiny, we inhabit a place (if we are lucky) that can never be lost, for the “heart [is] / a secret tower I inhabit,” writes the poet, like her name that is as eternal and enduring as the “pyramid, antique amulet” is to the Egyptologist and the mummies in pursuit of the afterlife (“Cornucopia”). The message, to me, is clear. We are to bring that afterlife into the current one, both in connecting with the tides around and within us, and in receiving the information given to us by nature and myth. So when I witness a swan swimming in “concentric circles,” as I often used to in the Bois de Boulogne, I “find the resonance of my core,” and embrace my “animal self” and “raison d’être,” integrating the “insubstantial, chameleon” and painfully “excavated” parts of myself and of my past, into my whole being, “like a talisman from wreckage, [a] resplendent fresco catapulted / beyond whimsical metaphoric frontiers” to be transformed within. 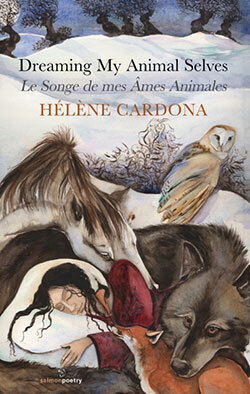 Hélène Cardona has given us a gift with this collection that both the English-speaker and francophone alike can appreciate. Anyone who has grieved the loss of childhood experience, of treasured places far away, or of a loved one close to home can appreciate the sensitivity with which the poet conveys her longing to recapture these losses in art. I find much to appreciate here, and I am relieved to discover that solid ground may be established by embracing all that we are: the dream-life, a connection to nature, memory, and the imaginary. All is forgiven and recalled, all energy becomes light when “I sing this whistling song,” from “the cliffs where the wild ones come” and “look at the other side of the world” from within (“Pathway to Gifts”). Erna Cooper is a writer and artist trained at UCLA and Oxford University. Her book Chiaroscuro: Aesthetics, Values and Autobiography in the Works of Willa Cather and Marguerite Duras will be published by Peter Lang in 2016. Her novel, Airspeed Oxford: The Adventures of Joan Yu, is available at Amazon.